Dale Dougherty, creator of MAKE: magazine and the Maker Faire, provides a guided tour of the international phenomenon known as the Maker Movement, a social revolution that is changing what gets made, how it's made, where it's made, and who makes it. Free to Make is a call to join what Dougherty calls the "renaissance of making," an invitation to see ourselves as creators and shapers of the world around us. As the internet thrives and world-changing technologies--like 3D printers and tiny microcontrollers--become increasingly affordable, people around the world are moving away from the passivity of one-size-fits-all consumption and command-and-control models of education and business. Free to Make explores how making revives abandoned and neglected urban areas, reinvigorates community spaces like libraries and museums, and even impacts our personal and social development--fostering a mindset that is engaged, playful, and resourceful. Free to Make asks us to imagine a world where making is an everyday occurrence in our schools, workplaces, and local communities, grounding us in the physical world and empowering us to solve the challenges we face. Join the maker movement There's a technological and creative revolution underway. Amazing new tools, materials and skills turn us all into makers. Using technology to make, repair or customize the things we need brings engineering, design and computer science to the masses. Fortunately for educators, this maker movement overlaps with the natural inclinations of children and the power of learning by doing. The active learner is at the center of the learning process, amplifying the best traditions of progressive education. This book helps educators bring the exciting opportunities of the maker movement to every classroom. Children are natural tinkerers Their seminal learning experiences come through direct experience with materials. Digital fabrication, such as 3D printing and physical computing, including Arduino, MaKey MaKey and Raspberry Pi, expands a child's toy and toolboxes with new ways to make things and new things to make. For the first time ever, childhood inventions may be printed, programmed or imbued with interactivity. Recycled materials can be brought back to life. While school traditionally separates art and science, theory and practice, such divisions are artificial. The real world just doesn't work that way Architects are artists. Craftsmen deal in aesthetics, tradition and mathematical precision. Video game developers rely on computer science. Engineering and industrial design are inseparable. The finest scientists are often accomplished musicians. The maker community brings children, hobbyists and professionals together in a glorious celebration of personal expression with a modern flare. When 3-D printing, precision cutting, microcomputer control, robotics and computer programming become integral to the art studio, auto shop or physics lab, every student needs access to tools, knowledge and problem solving skills. The maker movement not only blurs the artificial boundaries between subject areas, it erases distinctions between art and science while most importantly obliterating the crippling practice of tracking students in academic pursuits or vocational training. There are now multiple pathways to learning what we have always taught and things to do that were unimaginable just a few years ago. Making for every classroom budget Even if you don't have access to expensive (but increasingly affordable) hardware, every classroom can become a makerspace where kids and teachers learn together through direct experience with an assortment of high and low-tech materials. The potential range, breadth, power, complexity and beauty of projects has never been greater thanks to the amazing new tools, materials, ingenuity and playfulness you will encounter in this book. In this practical guide, Sylvia Martinez and Gary Stager provide K-12 educators with the how, why, and cool stuff that supports classroom making. Makeologyintroduces the emerging landscape of the Maker Movement and its connection to interest-driven learning. While the movement is fueled in part by new tools, technologies, and online communities available to today's makers, its simultaneous emphasis on engaging the world through design and sharing with others harkens back to early educational predecessors including Froebel, Dewey, Montessori, and Papert. Makers as Learners (Volume 2)highlights leading researchers and practitioners as they discuss and share current perspectives on the Maker movement and research on educational outcomes in makerspaces. Each chapter closes with a set of practical takeaways for educators, researchers, and parents. Makeologyintroduces the emerging landscape of the Maker Movement and its connection to interest-driven learning. While the movement is fueled in part by new tools, technologies, and online communities available to today's makers, its simultaneous emphasis on engaging the world through design and sharing with others harkens back to early educational predecessors including Froebel, Dewey, Montessori, and Papert. Makerspaces as Learning Environments (Volume 1)focuses on making in a variety of educational ecosystems, spanning nursery schools, K-12 environments, higher education, museums, and after-school spaces. Each chapter closes with a set of practical takeaways for educators, researchers, and parents. The Agency by Design guide to implementing maker-centered teaching and learning Maker-Centered Learning provides both a theoretical framework and practical resources for the educators, curriculum developers, librarians, administrators, and parents navigating this burgeoning field. Written by the expert team from the Agency by Design initiative at Harvard′s Project Zero, this book Identifies a set of educational practices and ideas that define maker-centered learning, and introduces the focal concepts of maker empowerment and sensitivity to design. Shares cutting edge research that provides evidence of the benefits of maker-centered learning for students and education as a whole. Presents a clear Project Zero-based framework for maker-centered teaching and learning Includes valuable educator resources that can be applied in a variety of design and maker-centered learning environments Describes unique thinking routines that foster the primary maker capacities of looking closely, exploring complexity, and finding opportunity. A surge of voices from government, industry, and education have argued that, in order to equip the next generation for life and work in the decades ahead, it is vital to support maker-centered learning in various educational environments. Maker-Centered Learning provides insight into what that means, and offers tools and knowledge that can be applied anywhere that learning takes place. "If you are determined to encourage creativity and provide a collaborative environment that will bring out the best in people, you will want this book by your side at all times." ?Bill Moggridge, Director of the Smithsonian's Cooper-Hewitt National Design Museum "Make Space is an articulate account about the importance of space; how we think about it, build it and thrive in it." ?James P. Hackett, President and CEO, Steelcase An inspiring guidebook filled with ways to alter space to fuel creative work and foster collaboration. Based on the work at the Stanford University d.school and its Environments Collaborative Initiative, Make Space is a tool that shows how space can be intentionally manipulated to ignite creativity. Appropriate for designers charged with creating new spaces or anyone interested in revamping an existing space, this guide offers novel and non-obvious strategies for changing surroundings specifically to enhance the ways in which teams and individuals communicate, work, play--and innovate. Inside are: Tools--tips on how to build everything from furniture, to wall treatments, and rigging Situations--scenarios, and layouts for sparking creative activities Insights--bite-sized lessons designed to shortcut your learning curve Space Studies--candid stories with lessons on creating spaces for making, learning, imagining, and connecting Design Template--a framework for understanding, planning, and building collaborative environments Make Space is a new and dynamic resource for activating creativity, communication and innovation across institutions, corporations, teams, and schools alike. Filled with tips and instructions that can be approached from a wide variety of angles, Make Space is a ready resource for empowering anyone to take control of an environment. Makers, get ready. This is your ultimate, must-have, tip-packed guide for taking your DIY projects to the next level—from basic wood- and metalworking skills to plugged-in fun with power tools, from cutting-edge electronics play to 3-D printing wizardry. Join Chris Hackett, Popular Science intrepid DIY columnist and star of the Science Channel’s Stuck with Hackett , on a rummage through the toolbox of yore—and a foray into the technologies of the future. HAND TOOLS A classic is a classic for a reason. Learn to build your own metal forge, screen-print whatever you want, swing a hammer better than your ancestors, and repurpose what Hackett calls “obtainium”—but what others might call trash—into your own mad-scientist creations. POWER TOOLS Discover the supreme joy that is angle-grinding, rig your own welding machine out of a junked car battery or three, and meet and master a whole host of electronic gadgets—LEDs, piezo buzzers, solar panels, and more. ROBOTS & BEYOND When it comes to making, there’s a whole new skillset in town. Get started with CNC milling, laser-cutting, programming microcontrollers, and 3D printing in a chapter that’s all about building what’s next. MUCH MORE Setting up a hackerspace, drones and space exploration tools, circuitry basics, sourcing and crowdsourcing and biotechnology- just to name a few more. You name it; it’s probably in this book. The Invent To Learn Guide to Fun features an assortment of insanely clever classroom-tested "maker" projects for learners of all ages. Josh Burker kicks classroom learning-by-making up a notch with step-by-step instructions, full-color photos, open-ended challenges, and sample code. Learn to paint with light, make your own "Operation Game," sew interactive stuffed creatures, build "Rube Goldberg" machines, design artbots, produce mathematically generated mosaic tiles, program adventure games, and more! Your MaKey MaKey, LEGO, old computer, recycled junk, and 3D printer will be put to good use in these fun and educational projects. With The Invent To Learn Guide to Fun in hand, kids, parents, and teachers are invited to embark on an exciting and fun learning adventure! You don't need to own a factory to make toys. Author and toymaker Bob Knetzger has been making fun stuff all his life with simple technology like vacuum forming and mold-making. In an age where makers are tantalized by the capabilities of 3d printers and other digital fab technology, this book takes you back to old-school hand tools, simple electronics, and working with metal and plastic to make toys every bit as good as those you can find in a big-box store. This book has something for everyone, from a marble maze to a talking booby trap; from custom cookie cutters to an "EZ Make" oven. Discover the basic principles of science, electronics, and engineering through hands-on projects that range from easy to more challenging... and are always fun! 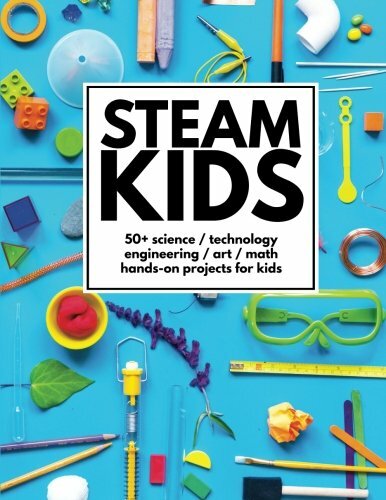 As seen on "The Late Late Show with James Corden" Supporting STEM education initiatives and the maker movement, the National Parenting Publication Award-winner Maker Lab includes 28 kid-safe projects and crafts that will get young inventors' wheels turning and make science pure fun. Each step-by-step activity is appropriate for kids ages 8-12, and ranked easy, medium, or hard, with an estimated time frame for completion. Requiring only household materials, young makers can build an exploding volcano, race balloon rocket cars, construct a solar system, make a lemon battery, and more. Photographs and facts carefully detail the "why" and "how" of each experiment using real-world examples to provide context so kids can gain a deeper understanding of the scientific principles applied. With a foreword by Jack Andraka, a teen award-winning inventor, Maker Lab will help kids find their inner inventor and create winning projects for school projects, science fairs, and beyond. A year's worth of captivating STEAM (Science, Technology, Engineering, Art & Math) activities that will wow the boredom right out of kids!Created by an MIT engineer, award winning educators, designers, and homeschooling experts, STEAM Kids will inspire your children to: question like a scientist design like a technologist build like an engineer create like an artist deduce like a mathematician - and, most importantly - play like a kid!Inside you'll find entertaining and educational projects like:- Rainbow Reactions- PVC Pipe Slingshot- Grafitti Art & Science- Color Changing Play Dough- Diaper Science- Circuit Bugs- Candy Mazes & so much more!Perfect for children ages 4-10, all the step-by-step activities are helpfully coded with difficulty indicators and estimated project times. Helpful project extensions promote further exploration and learning for enthusiastic children.Bonus materials will make things easy for parents and educators, and include: a handy weekly planning guide, project shopping lists, STEAM journal and more.So gather up your curious kids and get your STEAM on! 55 playful experiments that encourage tinkering, curiosity, and creative thinking from the creator of Tinkerlab.com--hands-on activities that explore art, science, and more. For children two and up. Kids are natural tinkerers. They experiment, explore, test, and play, and they learn a great deal about problem-solving through questions and hands-on experiments. They don't see lines between disciplines; rather, they notice interesting materials and ideas that are worth exploring. This book is about creative experiments, in all fields, that help kids explore the world. Children gravitate toward sensory experiences (playing with slime), figuring out how things work (taking toys apart), and testing the limits of materials (mixing a tray of paint together until it makes a solid mass of brown). They're not limited by their imaginations, and a wooden spoon can become a magic wand as quickly as a bag of pom-poms can become a hot bowl of soup. This book is about helping parents and teachers of babies, toddlers, and preschoolers understand and tap into this natural energy with engaging, kid-tested, easy-to-implement projects that value process over product. The creative experiments shared in this book foster curiosity, promote creative and critical thinking, and encourage tinkering--mindsets that are important to children growing up in a world that values independent thinking. In addition to offering a host of activities that parents and teachers can put to use right away, this book also includes a buffet of recipes (magic potions, different kinds of play dough, silly putty, and homemade butter) and a detailed list of materials to include in the art pantry. This Is Not Your Average Art Book. Brought to you by the Exploratorium's Tinkering Studio, The Art of Tinkering is an unprecedented celebration of what it means to tinker: to take things apart, explore tools and materials, and build wondrous, wild art that's part science and part technology. Join 150+ makers as they share the stories behind their beautiful and bold work and use this book to do some tinkering yourself. We do mean "use this book" in a literal sense... you won't even be able to reach the first page before using it. The Art of Tinkering is a collection of exhibits, artwork, and projects that celebrate a whole new way to learn, in which people create their own knowledge through making and doing, working with readily available materials, getting their hands dirty, collaborating with others, problem-solving in the most fun sense of the word, and, yes, oftentimes failing and bouncing back from getting stuck. Each artist featured in The Art of Tinkering goes through this process, and lovingly shares the backstory behind their own work so that readers can feel invited to join in on the whimsy. Whether it's sharing their favorite tools (who knew toenail clippers could be so handy?) or offering a glimpse of their workspaces (you'd be amazed how many electronics tools you can pack into one pantry! ), the stories, lessons, and tips in The Art of Tinkering offer a fascinating portrait of today's maker scene. Artists include: Learn from greats like Scott Weaver, Arthur Ganson, Moxie, Tim Hunkin, AnnMarie Thomas, Ranjit Bhatnajar and Jie Qi. Computer hacking takes on a whole new meaning when you're going at it with a screwdriver and hammer: announcing the most wildly inventive, eco-friendly craft book on repurposing everyday objects since Generation T. Except in this case the raw material isn't a T-shirt, but the stuff we all have lying around and have no idea what to do with, or even how to get rid of properly-your old cell phone, a broken printer, irredeemable iPod, busted digital camera, mysterious thatches of cables and wires, orphaned keyboards, and of course, those dead PCs and laptops. Created by a Parsons design graduate who's obsessed with navigating the intersection of art and technology, here are 62 ingenious projects that are irresistibly geek-chic. An iMac Terrarium-how cool is that? A laptop Digital Photo Frame. The impressively green Scanner Compost Bin. Plus a power strip Bird Feeder, Walkman Soap Dish, My First Squiggle Bot, Qwerty Hair Tie, Flat-screen Ant Farm. Each project has complete, step-by-step instructions, is rated by difficulty-in a thorough first chapter the author covers all the tools and skills needed to take apart electronics safely-and is arranged by use, from stuff for the house, to fashion, toys, arts and crafts, items for pets, and more. Don't throw away that box! Why not turn it into something amazing instead? This incredibly creative book shows kids that by using easy-to-find art and craft materials, the ideas, templates and stickers included in the book, and most importantly, a ton of imagination, simple cardboard boxes can be transformed into a robot costume, a princess castle, a circus, and so much more! In Duct Tape Engineer, hands-on educator, master tinkerer, and author of Rubber Band Engineer, Lance Akiyama will show you how to design, sculpt, and build backpacks, kayaks, catapults, and queen-size beds out of duct tape in your own backyard. These fourteen projects are designed to be long-lasting as well as fun, and include advice on solid construction techniques and even weather proofing. Packed with full-color illustrations and easy to follow instructions, Duct Tape Engineer will make the perfect gift for any kid or kid at heart. Explore an all-new ideas book that unlocks the secrets of LEGO#65533; building and shows fans how to create a world with their imagination. Beautiful clear photography and informative text demonstrates how entire models are built while also providing step-by-step visual breakdowns and offering alternative ways to build models. Explore each chapter as it steadily creates a themed world and ultimately showcases a dynamic diorama of the complete build, showing readers that they, too, can build an entire LEGO world from scratch--brick by brick, model by model. Inspiring creativity and imagination, LEGO Awesome Ideas has been named to the International Literacy Association and Children's Book Council Children's Choices List. With creative model ideas and visual tips and techniques, LEGO Awesome Ideas will inspire everyone from beginners to accomplished builders. LEGO, the LEGO logo, the Brick and Knob configurations and the Minifigure are trademarks of the LEGO Group. #65533; 2015 The LEGO Group. Produced by DK Publishing under license from the LEGO Group. Makey Makey is a kit that helps you turn everyday objects into touchpads that control your computer's keyboard. With this book, students learn the art of innovation through detailed explanations and hands-on activities built to foster creativity and problem solving. Fun, engaging text introduces readers to new ideas and builds on maker-related concepts they may already know. Additional tools, including a glossary and an index, help students learn new vocabulary and locate information. The Raspberry Pi is a small computer that allows almost anyone to learn about computer programming. Readers will discover new processes, integrate visual information with text, and and learn technical word meanings as they find out how the Raspberry Pi was invented and how makers are using it today. They will also learn how to set up and begin programming their own Raspberry Pis. In this super fun book, Sylvia teaches you to understand Arduino microcontroller programming by inventing an adjustable strobe and two digital musical instruments you can play! Along the way, you'll learn a lot about electronics, coding, science, and engineering.Written and illustrated by a kid, for kids of all ages, Sylvia's whimsical graphics and clever explanations make powerful STEM (Science, Technology, Engineering, and Math) concepts accessible and fun. The Ultimate LEGO Book contains everything that LEGO fans have ever wanted to know about the LEGO Group and the LEGO System of toys. The book begins with a detailed visual timeline that tells the remarkable story of the company that grew from a village carpenter's workshop into one of the world's best-known family brands. The LEGO Masterbuilders section reveals how professional LEGO model makers work, and mow several incredible LEGO models are made. the book then explores the LEGOLAND theme parks and reveals the secret of many of their most exciting attractions. The final section examines the unlimited possibilities of the LEGO brick, and how this apparently simple toy has inspired numerous architects, designers, and artists. Not content with raiding LEGO photo archives from London to California, DK sent editors, designers, and photographers to LEGO HQ in Billund, Denmark, and to the LEGO model-making centers at Billund and Windsor, England, to make this book the complete guide to the LEGO universe. Is there a LEGO(R) lover in your house? Then let's get learning Harness your child's passion for LEGO(R) to get them learning in ways they never imagined. The Unofficial Guide to Learning with LEGO(R) brings you tons of awesome, LEGO(R)-based ideas to work on every aspect of education and development. Starting with the basics like learning colors and counting, all the way up to engineering and other STEM topics - we cover it all. What's the difference between a tile and a plate? Why isn't it a good idea to stack bricks in columns to make a wall? How do you build a LEGO mosaic or build at different scales? You'll find the answers to these and other questions in The Unofficial LEGO Builder's Guide. Now in full color, this brand-new edition of a well-loved favorite will show you how to: Construct models that won't fall apart Choose the right pieces and substitute when needed Build to micro, jumbo, and miniland scale Make playable board games out of LEGO pieces Create photo mosaics and curved sculptures Build a miniature space shuttle, a minifig-sized train station, and more Of course, the real fun of LEGO building lies in creating your own models—from choosing the subject to clicking that final brick into place. Learn how in The Unofficial LEGO Builder's Guide. Includes the Brickopedia, a visual dictionary of nearly 300 of the most commonly used LEGO elements! Now an Amazon Best Kids' Books of 2016 pick! Balancing your child's screen time can be difficult, especially when it comes to wildly popular, open-ended video games like Minecraft. Minecraft offers players an environment focused on exploration, imagination, and creation, but its nonlinear game structure can mean spending a lot of time in the game. Unofficial Minecraft Lab for Kids includes a variety of creative exercises that explore the game's aspects and uses them to teach fun, educational lessons. You will start the book by brushing up on some common Minecraft language and examining each of the four game modes: survival, creative, adventure, and spectator. Then, you'll use this knowledge to venture off onto the six different quests that encourage child and adult participation. These "gamified" labs will allow your child to earn stickers and badges as rewards as they complete quests. You'll even learn how to screencast and narrate your own videos to share with family and friends! Unofficial Minecraft Lab for Kids provides a fun, educational gaming goals that you and your child can reach together! As they become more common and more powerful, 3D printers are allowing makers everywhere to bring their ideas to life. Readers will discover new processes, integrate visual information with text, and learn technical word meanings as they discover how 3D printers work and how makers are using them today. They will also learn how to create their own inventions from 3D computer models. Though they may sound like something out of science fiction, 3-D printers are not only real but also increasingly common. Popular with both the Maker Movement and businesses, the 3-D printer has multiple uses. It's great for making prototypes and creating cool projects. Some experts even believe that additive manufacturing, or 3-D printing on the industrial level, is the wave of the future. Readers will learn about a variety of 3-D printing methods, weigh the pros and cons of 3-D printing, and discover 3-D printing's applications in fields as diverse as fashion, food, and medicine. Written for children ages 8-12 with little to no coding experience, this straightforward visual guide uses fun graphics and easy-to-follow instructions to show young learners how to build their own computer projects using Scratch, a popular free programming language. With Coding Games in Scratch, kids can build single and multiplayer platform games, create puzzles and memory games, race through mazes, add animation, and more. All they need is a desktop or laptop with Adobe 10.2 or later, and an internet connection to download Scratch 2.0. Coding can be done without download on https://scratch.mit.edu. Essential coding concepts are explained using eight build-along game projects that guide young coders step-by-step, using visual samples, easy-to-follow instructions, and fun pixel art. The book teaches important strategies for solving problems, designing projects, and communicating ideas, all while creating games to play with their friends. Supporting STEM education initiatives and the maker movement, computer coding teaches kids how to think creatively, work collaboratively, and reason systematically, and is quickly becoming a necessary and sought-after skill. DK's computer coding books are full of fun exercises with step-by-step guidance, making them the perfect introductory tools for building vital skills in computer programming. Take kids from browsing to building with DK Workbooks: Computer Coding. Created for children ages 6-9, this highly visual workbook builds basic programming skills using Python, a free computer coding program and language available for download. Perfect for beginner coders, DK Workbooks: Computer Coding explains how computer coding works and teaches kids how to complete simple coding actions with clear, step-by-step instructions and fun pixel art. All they need is a desktop or laptop, and an internet connection to download Python 3. From creating lists to solving math problems to controlling a robot in a maze, young coders will learn how to think like a computer. Kids can even test their coding knowledge with written quizzes at the end of each section and a glossary at the back of the book. Supporting STEM education initiatives, computer coding teaches kids how to think creatively, work collaboratively, and reason systematically, and is quickly becoming a necessary and sought-after skill. DK's computer coding books are full of fun exercises with step-by-step guidance, making them the perfect introductory tools for building vital skills in computer programming. "Hello Ruby is half picture book and half activity book rolled into one adorable package. It introduces programming without requiring a computer at all. The point of the book isn’t to teach you a programming language, but programming concepts." --GeekMom.com Meet Ruby—a small girl with a huge imagination, and the determination to solve any puzzle. As Ruby stomps around her world making new friends, including the Wise Snow Leopard, the Friendly Foxes, and the Messy Robots, kids will be introduced to the fundamentals of computational thinking, like how to break big problems into small ones, create step-by-step plans, look for patterns and think outside the box through storytelling. Then, these basic concepts at the core of coding and programmingwill be reinforced through fun playful exercises and activities that encourage exploration and creativity. In Ruby's world anything is possible if you put your mind to it. ScratchJr is a free, introductory computer programming language that runs on iPads, Android tablets, Amazon tablets, and Chromebooks. Inspired by Scratch, the wildly popular programming language used by millions of children worldwide, ScratchJr helps even younger kids create their own playful animations, interactive stories, and dynamic games. The Official ScratchJr Book is the perfect companion to this free app and makes coding easy and fun for all. Kids learn to program by connecting blocks of code to make characters move, jump, dance, and sing. Each chapter includes several activities that build on one another, culminating in a fun final project. These hands-on activities help kids develop computational-thinking, problem-solving, and design skills. In each activity, you'll find: Step-by-step, easy-to-follow directions Ways to connect the activity with literacy and math concepts Tips for grown-ups and teachers Creative challenges to take the learning further By the end of the book, kids will be ready for all sorts of new programming adventures! The ScratchJr app now supports English, Spanish, Catalan, Dutch, French, Italian, and Thai. "This is a most joyful and clever whimsy, the kind that lightens the heart and puts a shine on the day," raved Kirkus Reviews in a starred review. Is it possible to eat snowballs doused in ketchup--and nothing else--all winter? Can a washing machine wash dishes? By reading the step-by-step instructions, kids can discover the answers to such all-important questions along with the book's curious narrator. Here are 12 "hypotheses," as well as lists of "what you need," "what to do," and "what happened" that are sure to make young readers laugh out loud as they learn how to conduct science experiments (really!). Jenny Offill and Nancy Carpenter--the ingenious pair that brought you 17 Things I'm Not Allowed to Do Anymore--have outdone themselves in this brilliant and outrageously funny book. A life lesson that all parents want their children to learn: It's OK to make a mistake. In fact, hooray for mistakes! A mistake is an adventure in creativity, a portal of discovery. A spill doesn't ruin a drawing--not when it becomes the shape of a goofy animal. And an accidental tear in your paper? Don't be upset about it when you can turn it into the roaring mouth of an alligator. An award winning, best-selling, one-of-a-kind interactive book, Beautiful Oops! shows young readers how every mistake is an opportunity to make something beautiful. A singular work of imagination, creativity, and paper engineering, Beautiful Oops! is filled with pop-ups, lift-the-flaps, tears, holes, overlays, bends, smudges, and even an accordion "telescope"--each demonstrating the magical transformation from blunder to wonder. With a simple, witty story and free-spirited illustrations, Peter H. Reynolds entices even the stubbornly uncreative among us to make a mark - and follow where it takes us. Her teacher smiled. "Just make a mark and see where it takes you." Art class is over, but Vashti is sitting glued to her chair in front of a blank piece of paper. The words of her teacher are a gentle invitation to express herself. But Vashti can’t draw - she’s no artist. To prove her point, Vashti jabs at a blank sheet of paper to make an unremarkable and angry mark. "There!" she says. That one little dot marks the beginning of Vashti’s journey of surprise and self-discovery. That special moment is the core of Peter H. Reynolds’s delicate fable about the creative spirit in all of us. 'If i built a car, it'd be totally new! Here are a few of the things that i'd do. . . .' Jack has designed the ultimate fantasy car. inspired by zeppelins and trains, Cadillacs and old planes, with brilliant colors and lots of shiny chrome, this far-out vision is ready to cruise! there's a fireplace, a pool, and even a snack bar! After a tour of the ritzy interior, robert the robot starts up the motor . . . and Jack and his dad set off on the wildest test drive ever! A hilarious, irreverent book about doing your own thing Meet Iggy Peck--creative, independent, and not afraid to express himself! In the spirit of David Shannon's No, David and Rosemary Wells's Noisy Nora, Iggy Peck will delight readers looking for irreverent, inspired fun. Iggy has one passion: building. His parents are proud of his fabulous creations, though they're sometimes surprised by his materials--who could forget the tower he built of dirty diapers? When his second-grade teacher declares her dislike of architecture, Iggy faces a challenge. He loves building too much to give it up! With Andrea Beaty's irresistible rhyming text and David Roberts's puckish illustrations, this book will charm creative kids everywhere, and amuse their sometimes bewildered parents. Also from the powerhouse author-illustrator team of Iggy Peck, Architect, is Rosie Revere, Engineer, a charming, witty picture book about believing in yourself and pursuing your passion. Ada Twist, Scientist, the companion picture book featuring the next kid from Iggy Peck's class, is available in September 2016. A creative spirit learns that thinking "ish-ly" is far more wonderful than "getting it right" in this gentle new fable from the creator of the award-winning picture book THE DOT. Ramon loved to draw. Anytime. Anything. Anywhere. Drawing is what Ramon does. It#65533;s what makes him happy. But in one split second, all that changes. A single reckless remark by Ramon's older brother, Leon, turns Ramon's carefree sketches into joyless struggles. Luckily for Ramon, though, his little sister, Marisol, sees the world differently. She opens his eyes to something a lot more valuable than getting things just "right." Combining the spareness of fable with the potency of parable, Peter Reynolds shines a bright beam of light on the need to kindle and tend our creative flames with care. Award-winning author and illustrator Ashley Spires has created a charming picture book about an unnamed girl and her very best friend, who happens to be a dog. The girl has a wonderful idea. ?She is going to make the most MAGNIFICENT thing! She knows just how it will look. She knows just how it will work. All she has to do is make it, and she makes things all the time. Easy-peasy!? But making her magnificent thing is anything but easy, and the girl tries and fails, repeatedly. Eventually, the girl gets really, really mad. She is so mad, in fact, that she quits. But after her dog convinces her to take a walk, she comes back to her project with renewed enthusiasm and manages to get it just right. For the early grades' exploration of character education, this funny book offers a perfect example of the rewards of perseverance and creativity. The girl's frustration and anger are vividly depicted in the detailed art, and the story offers good options for dealing honestly with these feelings, while at the same time reassuring children that it's okay to make mistakes. The clever use of verbs in groups of threes is both fun and functional, offering opportunities for wonderful vocabulary enrichment. The girl doesn't just ?make? her magnificent thing --- she ?tinkers and hammers and measures,? she ?smoothes and wrenches and fiddles,? she ?twists and tweaks and fastens.' These precise action words are likely to fire up the imaginations of youngsters eager to create their own inventions and is a great tie-in to learning about Science, Technology, Engineering and Math. A box is just a box . . . unless it's not a box. From mountain to rocket ship, a small rabbit shows that a box will go as far as the imagination allows. Inspired by a memory of sitting in a box on her driveway with her sister, Antoinette Portis captures the thrill when pretend feels so real that it actually becomes real—when the imagination takes over and inside a cardboard box, a child is transported to a world where anything is possible. Antoinette Portis again captures the thrill of when pretend feels so real that it becomes real. With a stick in hand, the options are endless—whether it's conducting an orchestra, painting a masterpiece, or slaying a dragon—give a child a stick and let imagination take over and the magic begin. Clink! Clankety-bang! Thump-whirr!That's the sound of Papa at work. Although he is an inventor, he has never made anything that works perfectly, and that's because he hasn't yet found a truly fantastic idea. But when he takes his family fishing on Lake Michigan, his daughter Virena asks, "Have you ever wondered what it's like to be a fish? "—and Papa is off to his workshop. With a lot of persistence and a little bit of help, Papa—who is based on the real-life inventor Lodner Phillips—creates a submarine that can take his family for a trip to the bottom of Lake Michigan. Fans of the best-selling Dragons Love Tacos will devour Adam Rubin and Daniel Salmieri's newest story, a hilarious picture book about robots that magically transforms into a super shiny metal ROBO-BOOK. FACT: Robots are awesome. They have lasers for eyes, rockets for feet, and supercomputers for brains! Plus, robots never have to eat steamed beans or take baths, or go to bed. If only there were some sort of magical "Robo-Sauce" that turned squishy little humans into giant awesome robots... Well, now there is. Giggle at the irreverent humor, gasp at the ingenious fold-out surprise ending, and gather the whole family to enjoy a unique story about the power of imagination. It's picture book technology the likes of which humanity has never seen! Do you know a young person who tends to argue or give excuses when you are trying to correct behaviour? Or a student who misinterprets praise and compliments? Teach them the social skills "how to accept feedback" and "how to give and receive compliments" using a kid-friendly story with a lesson that enriches social emotional learning. This entertaining story follows RJ as he goes about his day doing the things he enjoys, such as blowing bubbles, playing soccer, and hanging out with friends. But when a couple of friends give him compliments, he just isn't sure how to respond! As RJ continues through the day, he hears from his teacher and parents that while there are many things he's doing very well, there are some things he needs to work on. His first reaction is to argue and make excuses. Throughout the story, RJ learns what it means to receive positive and negative feedbak, and how to respond appropriately to that feedback. Parents and teachers will love taking kids on RJ's journey as he discovers feedback's many forms, and he learns to accept and grow from criticism and compliments at home, in school, and with friends. This book is the sixth in Julia Cook's BEST Me I Can Be! series which teaches children in grades K-6 social skills that can make home life happier and school more successful. By the time she's two years old, Violet Van Winkle can fix nearly any appliance in the house. And by eight she's building elaborate flying machines from scratch - mind-boggling contraptions such as the Tubbubbler, the Bicycopter, and the Wing-a-ma-jig. The kids at school tease her, but they have no idea what she's capable of. Maybe she could earn their respect by winning the blue ribbon in the upcoming Air Show. Or maybe something even better will happen - something involving her best ever invention, a Boy Scout troop in peril, and even the mayor himself! A classic underdog story full of humour and sweetness and retro pizzazz, Violet the Pilotis both endearing and adorable. It'll fly right into your heart. Did you know you can stretch and grow your own brain? Or that making mistakes is one of the best ways your brain learns? Just like how lifting weights helps your muscles get stronger, trying new things without giving up--like finding the courage to put your face in the water the first time you're at a pool--strengthens your brain. Next time, your brain will remind you that you overcame that fear, and you will be braver! As a consultant to schools worldwide on issues of brain development and gender equity, authorJoAnn Deak, Ph.D., and illustratorSarah Ackerley, have crafted a fun and engaging introduction to the anatomy and functions of the brain that will empower each young reader to S-T-R-E-T-C-H and grow their Fantastic, Elastic Brain!